The systems in hundreds of urban areas make it less stressful to explore a new – or even old – place. If you are traveling to Boston, Montreal or one of hundreds of other cities this summer, consider trying the local bike share system. Bicycling is often faster than driving in urban areas, and you can cover a lot more territory than you can by walking. You’re likely to save money on parking, even when you factor in the cost of the bike share. Many cities have bike share stations at public transit stops, so it’s easy to combine biking, buses and subways to get to your destinations. PORTLAND’S MULTI-YEAR EFFORT to start a bike sharing system is gathering momentum. A new nonprofit, Portland Bike Share Inc., is raising money for capital and operational costs. The goal is to start a system with 15 stations on the peninsula, and eventually expand to include neighboring communities such as South Portland. Find out more at portlandbikeshare.com. SINCE I STARTED writing this column, I’ve heard an earful from readers who complain about the behavior of either cyclists or motorists. An upcoming column will discuss how to improve relations between the two groups. Please email me your specific and constructive ideas at [email protected]. But the best reason to try bike sharing is to see sights you’d otherwise pass by in a blur. If urban bicycling conjures images of crazy bike messengers weaving through rush-hour traffic, here’s some good news: Cities such as New York and Minneapolis that have invested in bike sharing also are expanding their bike-path networks. With advance planning, you can chart your route to avoid roads. I used bike sharing for the first time in Washington, D.C. I wanted to see the monuments honoring Martin Luther King Jr. and Franklin Delano Roosevelt, and I had just enough time to do so early one morning. Like most bike share bicycles, mine was heavy, had upright handlebars and only three speeds. I wasn’t going to win any races. But the bike felt very sturdy, and it was in decent shape. Bicycling made it a breeze to cover the distance to the monuments. I also circled the Tidal Basin and rode by the Capitol, staying on paths the whole way. As I passed clusters of joggers in intense conversation, I wondered what legislative deals were being cut all around me. A couple of years ago, I took a more ambitious ride using New York’s Citi Bike, the largest bike share system in the country. I downloaded two apps to chart my course. The first showed all of the bike share stations and told how many bikes were available at each. The second app showed the city’s bike paths. While switching bikes every 30 minutes might seem tiresome, I treated it like a game. I picked up my first bike in the Tribeca neighborhood of Manhattan, then followed the West Side Bike Path along the Hudson River, passing fields of lavender and roses in full bloom. I was cruising along, happy as could be, but my first 30 minutes was nearly up. The Citi Bike app showed me a station a block away. I snapped my bike into a holder, unlocked another bike and continued to Midtown. A half-hour later, I encountered my only problem of the day. When I stopped at a third station to swap my bike, none was available. A message on the kiosk told me how to request an additional 15 minutes so I could get to a nearby station, but that entailed biking on city streets. A huge truck snuggled way too close for comfort. Rather than brave more city riding, I dropped off the bike and walked to my next destination: Central Park. I found another bike share station right outside the entrance. Bicycling is the perfect way to see the park. In less than an hour, I crisscrossed from one end to the other, passing a lake, a castle and the Strawberry Fields memorial to John Lennon. My final tally: 170 blocks covered over four hours, for a cost of $16. How else could you get that much entertainment for that little money in New York? 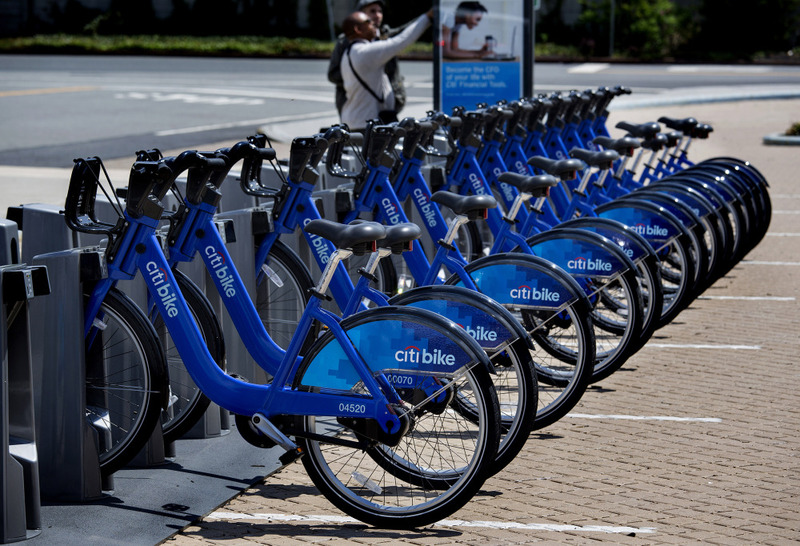 Bike sharing has caught on in a big way during the past decade. In 2014, more than 850 cities around the world had bike sharing. You can find a list of U.S. systems on pedbikeinfo.org. Before your trip, look at the membership options online. You’ll also want to find out how many bike stations are available so you’ll know ahead of time how convenient the system will be. One more tip: find out whether helmets are provided. While a few systems offer free helmets, many require you to bring your own.